This award recognizes alumni who have made personal and professional contributions to society, demonstrated exemplary support to the Washburn University Alumni Association and the community, been of service to humanity, distinguished themselves in their careers and brought honor to Washburn through their accomplishments. Pam O’Toole Trusdale is the executive director of the National Association of Trailer Manufacturers, a life member of the Washburn Alumni Association, and served on the Washburn University Board of Regents from 2011-2015, serving as vice chair from 2014-2015. She was president of Nonoso alumnae chapter from 2013-2015, and served as the chairman of the Stormont Vail Foundation from 2006-2009. While at Washburn she was a member of Kappa Alpha Theta, and is a past president, past corporation president, and Washburn Chapter Financial Advisor to the sorority. After graduation, David Manley served four years in the Air Force including a year in the Vietnam War. After completing his military service, he was employed by Blue Cross and Blue Shield of Kansas holding various management positions eventually leading him to becoming vice president, member services until 2004 when he retired after 32 years with the company. Manley was an active member of the Washburn University Alumni Board of Directors from 2011-2015, and was integral in developing the Ichabod bench sculpture west of Morgan Hall. He currently serves as chairman on the administrative council for Crestview United Methodist Church, Topeka, Kansas. This award honors women who have distinguished themselves as teachers, instructors, administrators or benefactors at Washburn and also have given service to the community and/or their chosen professions. The award is named after suffragist, lawyer and publisher Lilla Day Monroe. Denise Ottinger has served as the first and only vice president for student life for Washburn University, overseeing Student Services, Career Services, Multicultural Affairs, Student Health and Counseling Services, Residential Living, Student Activities and Greek Life and the Student Recreation and Wellness Center. She received her bachelor’s, master’s and doctorate degrees from Bowling Green State University and was awarded its Alumna of the Year in the Higher Education Administration PhD program. She is a diamond honoree from the American College Personnel Association, and she has served on the Optimist Club and Big Brothers Big Sisters boards in Topeka. She has also been an active member in the Mortar Board National Senior Honor Society. This award honors men who have distinguished themselves as teachers, instructors, administrators or benefactors at Washburn and also have given service to the community and/or their chosen professions. The award is named after Col. John Ritchie, who donated the land on which Washburn is built. Jim David Martin is the Henrietta and G.W. Snyder Jr. professor for the Washburn University School of Business and former senior vice president of finance for Westar Energy. He has been a board member of the Kansas City Chapter of Financial Executives International and the Washburn Catholic Campus Center. He is also a member of Leadership Greater Topeka, Kansas Society of CPAs and Sigma Phi Epsilon. He received the Ned N. Fleming Excellence in Teaching Award in 2014, the John C. & Betty Dicus Teaching Excellence Award in 2006 and 2013, and the A. Roy Meyers Award for Excellence in Research in 2012. This award honors recent Washburn graduates who demonstrate leadership in career or civic endeavors and loyalty to Washburn. Recipients of the award must have graduated within the past 10 years. Ashley Charest is the vice president, membership development for the Greater Topeka Chamber of Commerce and is the former vice president, client relations for Centric Management and Consulting. Charest is the current president of the Kansas Society of Association Executives, former chair of the American Cancer Society’s Couture for Cancer, served on the Board of Directors from 2009-2015 for Court Appointed Special Advocates, and has served on the Kappa Alpha Theta Alumnae Board as vice president, membership, fundraising chair and president. She is also a certified association executive and a member of Leadership Greater Topeka. Bill Gahnstrom has been a lecturer in the math and statistics department at Washburn for 22 years, and Emilie Gahnstrom has been a full-time volunteer for more than 20 years for KTWU, Topeka Civic Theatre and as a Shawnee County Master Gardener. 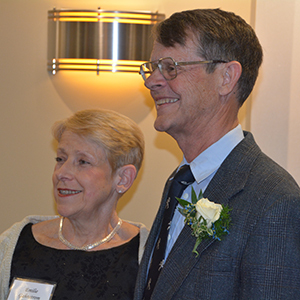 Bill and Emilie joined the Washburn University Alumni Association in 2001 and became life members in 2006. They regularly attend a wide range of activities at Washburn including After Hours, tailgating and Washburn music performances, and they have volunteered at KTWU for many years. Bill is a football and basketball season ticket holder and attends athletic events involving his current students. Bill and Emilie have also provided financial support for Washburn in a variety of ways. Bill has served as secretary of the Kaw Valley Chapter of the Military Officer’s Association of America and as treasurer of the Highland Park High School Alumni Association. He has received a Meritorious Medal and a Navy Commendation Medal with two stars from the U.S. Navy. Emilie is also a Topeka Daylily Club photographer, and she has photographed three national award-winning daylily designs.